It looks like an ordinary Japan with ordinary people, but when those ordinary people’s emotions become too much, mysterious powers awaken. Those that die with these strong feelings become Variants, and the ones that keep living are called the Disobeyers. The struggle between Variants and Disobeyers is the premise for Magical Eyes – Red is for Anguish. The fights in this game go into an impressive amount of detail. Yuu Amakawa happens to be one of the Disobeyers. You wouldn’t know it, though–his powers may come from strong emotions, but he tends to lock them up and distance himself from others. He does well at high school, but quite often he has to miss a day to focus on his job, which is to track down and fight Variants. Since Variants tend to act irrationally and destroy whatever gets in their way, they’re usually pretty dangerous, but Yuu is strong enough to take down just about anything. It’s not all hard work, though. When Yuu is at school, he does have at least one good friend: Chiharu Ogawa, a young woman who is just as isolated as himself. Although Yuu is the main protagonist, there is also a pretty large share of scenes from Chiharu’s point of view, revealing that she really cares deeply about Yuu. Of course, because both are very shy and distant people, and because Yuu is secretive about his work, the two tend to dance around each other a lot. A single thoughtful text message, a casual comment–tiny things can cause huge ripples in their relationship because they’re both so introspective. It would seem ridiculous if I didn’t know what that’s like myself! Plus there’s lots of silly banter between them. Unfortunately, the Golden Week vacation from school doesn’t give Yuu much time–he’s stuck working on a pretty big case. Besides a general increase in the number of murder cases around town, he has to investigate a very strange robbery. The injured victim claims that he was assaulted by a living doll, the exact likes of one he had in his back yard. Is someone controlling the doll? Is it a Variant itself? What would it attack for? It quickly becomes apparent that this doll has been surrounded by mysterious events for a long time. 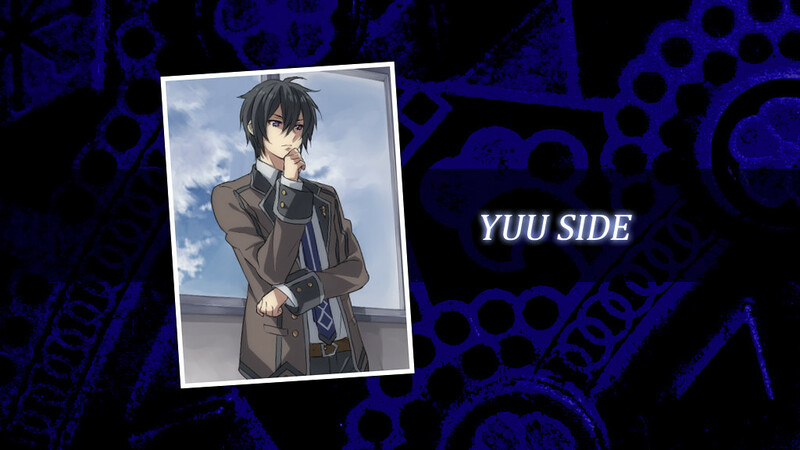 Most of the other characters are people close to Yuu and the investigation. His little brother and sister, an old friend, and several of his fellow Disobeyers play a part. Each one is quirky, but the story doesn’t dwell too much on their odd little mannerisms. Yuu just sort of takes them in stride, since he’s known them all a long time. It only becomes relevant when they become an obstacle to the case–or Yuu’s own safety, which happens more than you’d think. Believe it or not, he’s just trying to say hello. On occasion, Yuu will stop to sit down and assess the situation, and you’ll enter Reasoning mode. Despite the name, you really aren’t expected to deduce anything. Rather, if you’ve been reading the dialogue and understood what the characters were saying, the three or four questions should be easy to answer. If you get all the questions right, you’ll unlock a bonus scene that gives you a deeper insight into one of the side characters. 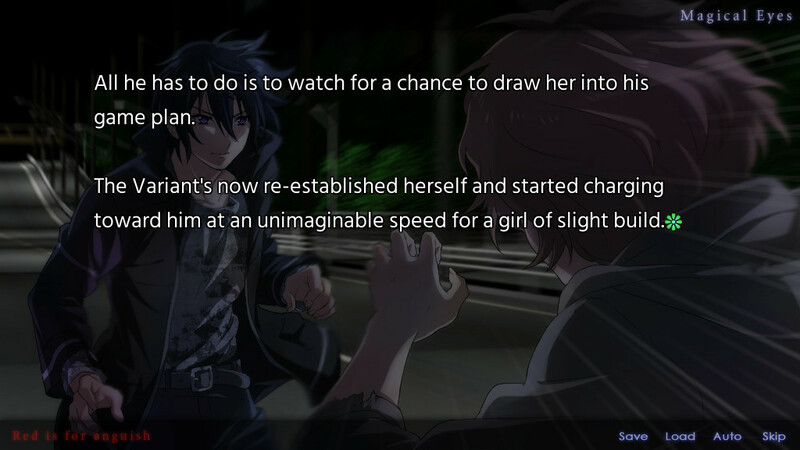 Unfortunately, though, this is pretty much the extent of the control you have over this visual novel. There are no branching paths or different endings on this one. 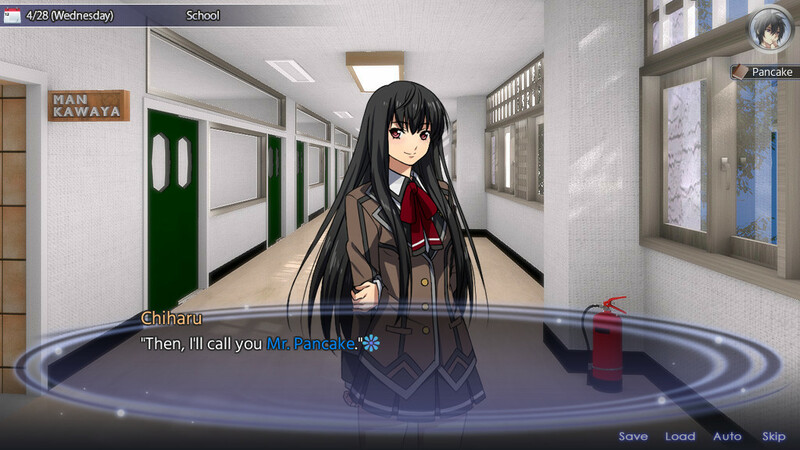 Like many other visual novels, this one opts to include voice acting (Japanese only) for all the characters except the protagonist. I actually found that to be odd and out of place in this context for a few reasons. For one thing, you’ll still spend about half your time playing as other characters, especially Chiharu, but all of them get full voices during their perspective. Also, it’s not like Yuu is just the audience’s window into the world of Magical Eyes, at least in my opinion. He’s very aware of himself and his own unique traits, and the other characters offer more insights that help you understand him even better as time goes on. I feel that his personality is just as developed as any other character in the story. Sorry, buddy. Maybe they’ll voice you next time. Well, maybe with one exception. Let’s just say, the villain and other supporting roles are developed pretty well. One character that’s a total mystery for the first half of Red is for Anguish becomes very fleshed out later on, and whether you consider him a villain or not, I have to appreciate the amount of attention he got. Frankly, it wasn’t a character I expected that much out of. Have I gotten my point across without spoiling the story for you? Regardless, the topic was voice acting, and I think that it was quite good in every scene (which is why I missed having it for Yuu). The music and graphic presentation were just okay, and I didn’t hate it, but it’s nothing you won’t find in any other graphic novel. 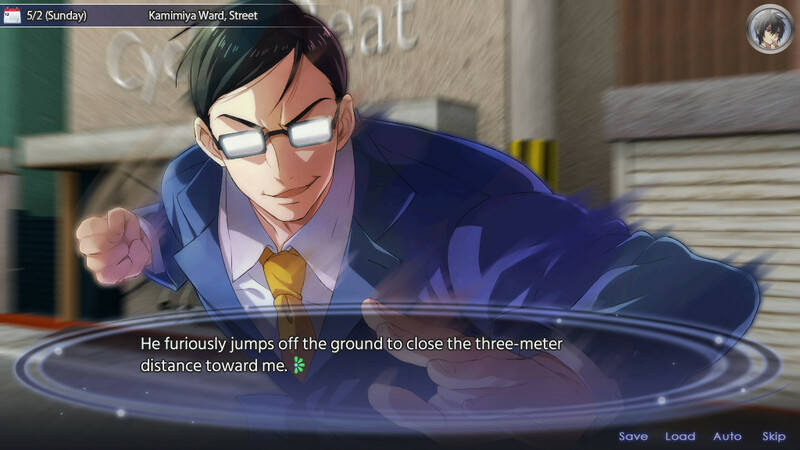 Characters stay in static positions on screen with a small range of predefined emotions and poses, and the only time that will change is in CGs. I can say that those CGs do look pretty good, though. So far, Magical Eyes – Red is for Anguish has been pretty decent or average in most respects, with major plus points on character development. But, there is one thing that really hurt it for me. Throughout the game, your save files will have the “Chapter 1” tag on them, and there are little side scenes that suggest there’s something way bigger going on than what Yuu is dealing with in his home city. But, just when the doll case is closed and it looks like we’re going to learn more about that larger story… the game ends. I reeeally wanted to know what this part was about. Turns out, Red is for Anguish is just the first chapter in the Magical Eyes series, and we’ll have to wait a while for the next one, Indigo Blue Heaven. 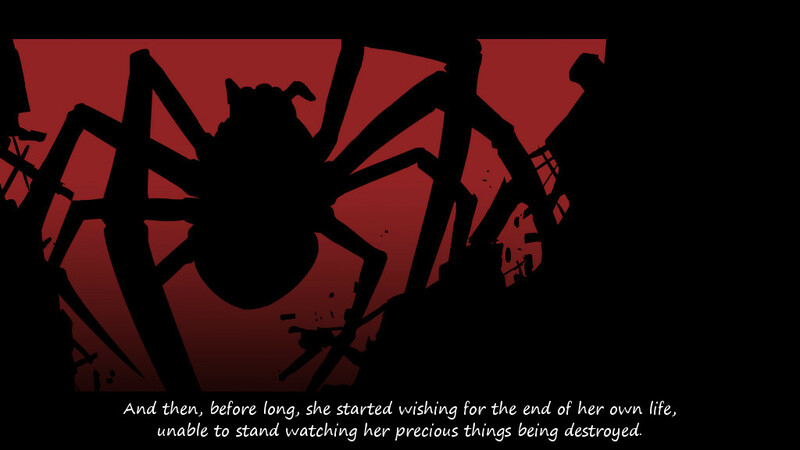 I don’t mind getting a short visual novel–just 5-10 hours in this case–if I’m satisfied at the end. Nor is there anything wrong with a series, if each one is a good standalone experience. But I really thought that I was in for one really good-sized game with this one, and it let me down. I don’t know how many chapters there will be, but this one is $14.99 USD on Steam and MangaGamer, and I can just see the full story getting really expensive. Maybe it’s just me, but that one rubs me the wrong way. So, there’s some good, some not so good, and a lot of just plain average. For this one, I suppose it depends on if you’re willing to commit to the whole series. While this game does wrap up a lot of major plot points by itself, and has a lot of strong writing to boot, I have a feeling we’re going to see the real payoff down the road. If that sounds worth it to you, then you might want to start here and now.